Organic Australian Tea Tree Essential Oil (Melaleuca Alternifolia) - Sweetgrass&Rain Inc. The Tea Tree is a small tree or shrub with needle-like leaves. It is also domestically referred to as Ti-Tree. It can grow up to 7 meters (20 feet) in height and thrives in marshy areas, though it is now cultivated in plantations. The aboriginal people of Australia have long used Tea tree Oil. Historically, the leaves were used as a substitute for tea, which is how it got its name. In World War II, the producers and the cutters of Tea Tree were exempt from military service until enough essential oil had been accumulated to accommodate the military's needs. Tea Tree is very robust and is ready for cutting only two years after its previous harvest. 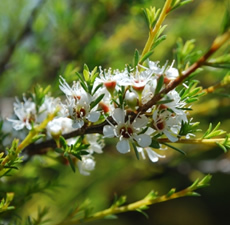 As Essential Oils have become more accepted by the public, the use of Tea Tree Oil has increased significantly. This is readily seen in the commercial products now using Tea Tree, although this grade is best used for therapeutic applications. Tee Tree Essential Oil has a fresh, slightly medicinal scent with characteristic woody, camphoraceous notes.